One of a kind necklace. 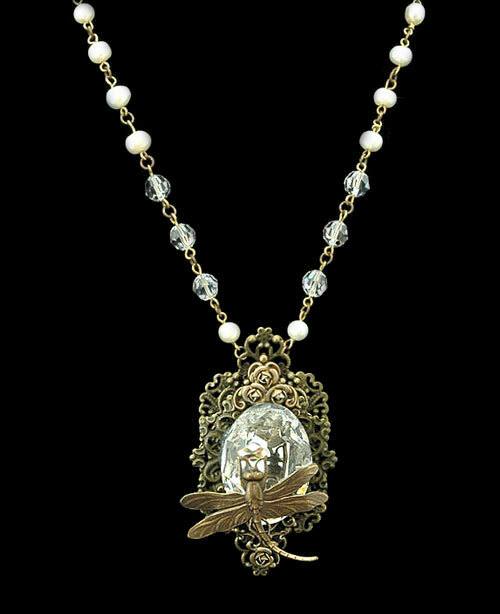 A beautiful highly detailed dragonfly offers a tiny Swarovski Golden Shadow color crystal as it rests atop one of the largest Swarovski crystals made. Tiny gold metal roses add a romantic feel to this piece which is suspended from a hand designed chain made up of Swarovski crystals, freshwater pearls and antique brass vase shaped beads. The pendant is 3” In length and 2” wide. The chain is 18” long.